In recent years we have been hearing a great deal about digital ‘disruption” and how it has been re-shaping the global economy and the society we live in. But are we focusing too much on the digital drivers and not enough on other areas of disruption across the economy? In Australia, the rise of Asian affluence, the global shift to lower cost manufacturing centres and the downturn in resources investment has had a material impact on the nature of the Australian economy. This has been most evident in employment trends over the past three years with a net loss of jobs in mining, manufacturing, agriculture and retail. While some of these changes can be attributed to digital forces, many of them are completely unrelated to the digital world. What’s more, while there has been a net loss of jobs in these four sectors, this has not been accompanied by a sharp increase in the unemployment rate and/or a recession for Australia. In fact, over the past three years Australia’s unemployment rate has declined from a peak of 6.3% in October 2014 to 5.5% in May 2017, while the economy has continued to experience positive economic growth. 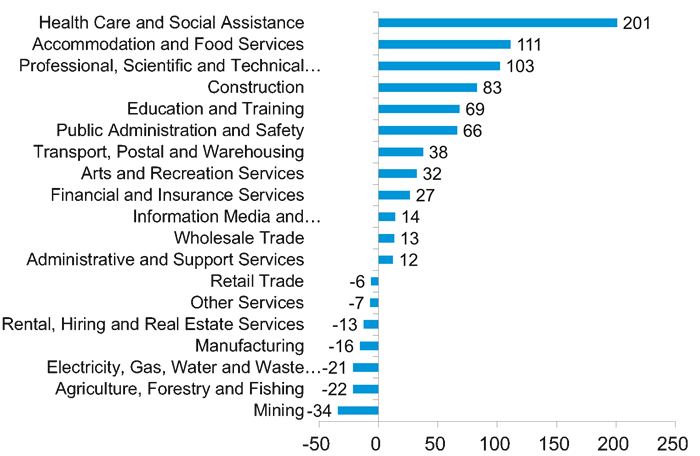 As shown in the chart below, jobs growth over the past three years has been largely in the service sectors of the Australian economy. The key drivers of jobs growth has been health care, hospitality, professional services, construction and education. Demand for these services is coming not only from locals, but also from the global economy. The rise of middle class income in Asia (as well as some softness in the Australian dollar) is certainly seeing a significant increase in demand for services such as tourism and education from international visitors to Australia. Source: ABS data, Industry jobs to 31 May 2017. From an investment perspective, ‘innovation and disruption’ can clearly present risks as well opportunities. However, in this information technology age, it’s easy to associate innovation and disruption with something digital, or online. But disruption and innovation is occurring in all kinds of businesses across the world and across a wide range of industry sectors. When investing in the age of disruption, one needs to consider much more than innovation itself. Many other factors will determine whether an innovative company will make a good investment – such as; barriers to entry, investment in R&D, product differentiation, sustainability of competitive advantages and the size of the market. The focus of management is also key. One sector of rapid change has been the automotive industry; one of the most established and competitive industries in the world. It’s easy to associate innovation and disruption in the auto sector with the development of electric motors and driverless vehicles. For investors in the Australian small companies sector however, exciting earnings opportunities are available from companies with innovative products and services in less futuristic areas. So ‘disruption’ in an industry and an economy can certainly be digital, but it can also be ‘innovation’ in an old industry, it can be related to changing global expectations (such as renewable energy and electric cars) or it can be in response to changing global income distribution and demographics. For economists, this is all part of the ongoing evolution of economies and how the wants and needs of people and businesses are fulfilled. For investors, opportunities (and challenges) abound.